What Is the Krups Coffee Maker? How Is the Krups Coffee Maker Different from Others? Ready to Make Your Own Delicious Coffee? Looking to buy a new Krups coffee maker? There’s a lot of debate out there about what country first discovered coffee, but in researching the history of the drink, you’ll learn that historians traced the invention back to Ethiopia. The nation has a legend that says it was a humble goat herder who first discovered coffee beans, noticing that after eating certain berries, his goats became too energized to sleep. The goat herder shared his discovery, and word spread about the amazing drink. Centuries passed and coffee spread across the world. European travelers to the East brought rumors back of a dark beverage, and by the 17th century, coffee was becoming wildly popular. Now, hundreds of years later, the enthusiasm for this energizing beverage hasn’t changed much. In fact, Americans are drinking more coffee now than they ever have in the past. But part of having a fantastic experience with coffee is choosing the right coffee maker. Is a Krups coffee maker the right way for you to start your day? The Krups Coffee Maker 7211002986 uses ThermoBrew technology with a 3-step brewing process. This technology effectively draws out all of the wonderful coffee flavors you crave. You can customize your brew to satisfy your unique taste. The pot holds 14 cups and comes with a permanent filter for convenience. Instead of waiting for the entire carafe to fill up before you can serve coffee, the Krups coffee maker has a pause-and-serve feature. The Krups coffee maker keeps your coffee warm for up to four hours and comes with an automatic shut-off feature. This will give you peace of mind on those busy mornings when you may or may not forget to turn off all your appliances before work. Select the brew cycle for any time, so that you can prepare it ahead of time. Then wake up to freshly-brewed coffee in the morning without having to make it. Many coffee makers require you to wait until the brew cycle is finished to serve the coffee. The Krups coffee maker, on the other hand, has a pause-and-serve feature for those mornings when you just don’t want to wait. In the coffee world, there’s some debate on whether permanent or disposable filters are better for flavor. For extra convenience, this Krups coffee maker has a permanent coffee filter. The filter not only makes your morning easier but also saves you money on buying disposable filters. You can choose to use either one. Most other coffee makers in this price range require you to insert pre-bought or prepared coffee grounds. The Krups 7211002986, on the other hand, both grinds and brews your coffee for you. Most standard coffee makers hold between 8 and 12 cups. The Krups 7211002986 has a 14-cup (70 fl oz) capacity that works well for entertaining guests. Whether you have a big family or just drink a lot of coffee, this above-average capacity is helpful. While it does have a large capacity, this Krups coffee maker also brews small one to four cup batches. This setting ensures that you get the most delicious cup from smaller amounts of coffee. The Krups 7211002986 uses a three-step brewing process designed to draw the most out of the coffee you use. This process uses a shower head design, hot water circuit, and proprietary FlavorMix Tube. The FlavorMix Tube stirs the coffee as it brews, a unique feature of the machine. You might want different things from your coffee on different days. This Krups coffee maker has flavor customization. Custom flavor means you can choose to make bold coffee if you want a strong brew or regular coffee for a standard cup. One feature that’s missing as compared with other luxury coffee makers is that the machine doesn’t meter the water. In other words, it will always use the full amount of water you put in. If you want a smaller batch, you’ll have to use less water. The grinder on this coffee maker works well, and steam doesn’t get into the grinding area. Users report that without moisture getting into the grinder, cleaning the machine just requires a quick brush. Customers say that the coffee maker doesn’t take up too much space on the counter. This space-saving function is thanks, at least partially, to its square shape which fits in well with other appliances. Since it has a large capacity and is bigger than similar coffee makers, this is convenient. Regarding how durable the machine feels as a whole, the build quality is good compared with cheaper machines. However, some users report that the carafe feels a bit flimsy for the machine quality. The lid might flip open when you’re pouring your coffee unless you hold it in place with your thumb. Some users report that, although this machine has a reusable filter, you may still want to use paper filters. Paper filters will ensure that there’s no sediment at the bottom of your cup. Many coffee makers have a narrow water tank that leads to spilling when you’re filling it up. This Krups coffee machine, however, is wide enough to pour quickly without spilling. If you’re switching from a small hand grinder to this machine, you might find that the grinding phase is loud. Depending on the work schedules of the people you live with, however, this may or may not be an issue. Before selecting a coffee maker, it’s a good idea to research average market prices for these machines. The price you can expect to pay for a coffee maker will differ depending on brewing quality and more. The brand you select also plays a role in the final cost. For a basic filter machine, you can spend as little as $20. This type is small and fits basically anywhere. To get a filter coffee machine that works better for a medium-sized office, you can expect to pay a fair amount of money. These tend to come with a permanent filter and better-quality hot plate than affordable machines. Bean to cup machines (that grind your coffee as well as brew it), such as the Krups coffee maker we’re reviewing, will cost more. Learning about new products online can be a serious challenge which is why we’ve cut out the work for you in this review. We found our information on this Krups coffee maker by combing through a selection of user reviews. We also read through information directly from the manufacturer. We also looked at what users were saying about pros, cons, and what you can realistically expect from the machine. Instead of only including the good qualities of the maker, we’ve made sure to explain some common concerns and complaints about it too. Including a spectrum of information will give you a more realistic picture of this Krups, coffee maker. Then you can make an informed decision on whether or not to add it to your kitchen. One good way to find out the quality of a product you’re using is comparing it to other brands. Below, we’ll cover three other comparable coffee machines in the same price range. This comparable product has a 24-hour programmable brewing timer. It uses a reusable gold filter basket like the Krups 7211002986 and uses charcoal water filtration. The charcoal feature cleans the water to deliver a better-tasting cup of coffee. You can remove the water tank on this machine, making the refill process easier. The carafe holds 12 cups, and the machine has an attractive stainless steel design. The Kenmore Elite 76772 has a comfortable handle with an easy-pour carafe, so you don’t spill when you’re tired in the morning. It is rated 4 out of 5 stars on Amazon. This machine has an easy auto-brew feature that makes it easy to set the time, and it also has a clear digital display. It comes equipped with a permanent gold filter that is reusable and safe for the dishwasher. The permanent filter not only saves time but reduces waste for increased environmental sustainability. The machine carafe has an eight-cup limit. This coffee maker uses shower head technology to saturate the coffee grounds evenly. This helps to extract as much flavor from the grounds as possible. One unique feature of the Rus​​sell Hobbs CM8100GYR is a freshness timer which shows how much time passed since you brewed the pot. It is rated 3.5 out of 5 stars on Amazon. Another fully automatic coffee maker, the Gourmia GCM6850 has one-touch brew controls. This machine is a smaller capacity coffee maker and can only make a two-cup batch or a four-cup batch at once. It does have a 60-ounce water reservoir, though, so you don’t have to refill it as often. This machine gently saturates grounds to extract flavors and aromas. To activate it, you only need to tap one of the three buttons for a pot of coffee or hot water. If you want to keep the liquid warm, you can also select that from one of the buttons. This coffee maker has a unique hourglass shape that will look great in any kitchen as it’s a neutral silver color. You can use it with the included steel cone filter or ordinary paper filters. Overall it’s a good choice for people who live alone or with a partner. It doesn’t have nearly the carrying capacity of the Krups coffee maker. It is rated 4 out of 5 stars on Amazon. The Krups 7211002986 Coffee Maker has a 4 out of 5-star rating on Amazon and can brew 14 cups at a time. It has a four-hour shutoff feature. The Kenmore Elite Stainless Steel 76772 coffee maker is rated 4 out of 5 stars on Amazon. It has a 12-cup carrying capacity and 2-hour shutoff function. The Russell Hobbs CM8100GYR Coffee Maker is rated 3.5 out of 5 stars on Amazon, has an 8-cup capacity and 40-minute shutoff time. 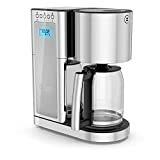 The Gourmia GCM6850 Automatic Coffee Maker costs almost similarly, and is rated 4 out of 5 stars on Amazon, has a 4-cup carrying capacity and a 2-hour shutoff feature. As with any other product, the Krups 7211002986 has a variety of pros and cons to keep in mind. Coffee is not only delicious but has some health benefits, including raising your metabolic rate. Overall, if you’d like to both grind and brew your own coffee at home, you’d do well to choose the Krups 7211002986 coffee maker. It uses advanced technology to make 14 cups of coffee at a time, which is more than most other coffee makers. It also gives you the option of choosing between bold, full-bodied flavor, and standard. The keep-warm function is four hours, which is significantly longer than other similar products. These features, combined with the automated timer and auto shutoff feature, make this Krups coffee maker a good choice. Just keep in mind that the machine is loud, so if you have a baby in the house, this could cause an issue. Whether you want to make a small pot or enough for an entire dinner party, this machine can do the job. Have fun wowing your guests with this advanced coffee technology and enjoy your brew! Previous articleIs a Black and Decker Coffee Maker Right for You? Next articleThe Breville Coffee Maker: Is It the Right Choice for Your Kitchen?